At Horgan’s Wedding Car Hire we fully understand when it comes to your big day we are fully aware that it is one of the most important days of a new bride and grooms life, which is why we will assist you through the process of selecting the right vehicle for your big day when you book your Wedding Car Hire in Alderley Edge with us. We will ensure you choose the perfect wedding vehicle and we will match any of your requirements or specifications through our extensive fleet of wedding cars. We will also ensure that each fine detail is taken care of. When you book Horgans Wedding Car Hire for your Alderley Edge Wedding be sure to get in touch with our team today. We will go above and beyond to ensure your day is memorable and special meaning you can always rely on us for the finer touches. 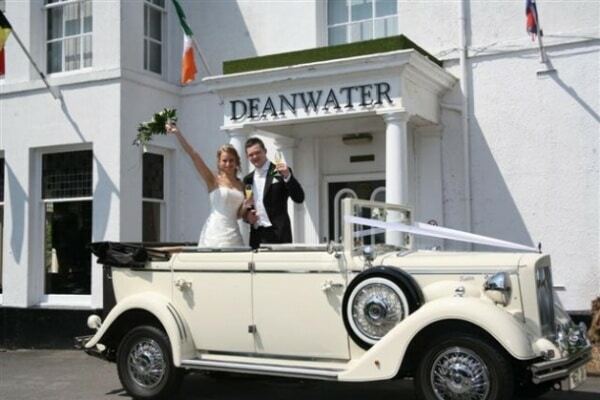 At Horgan’s we can provide you with the award winning Beauford, to the Royale Regent and Imperial Wedding Cars or our popular Charabanc eight-seater omnibus, which has been specially created for the wedding industry. 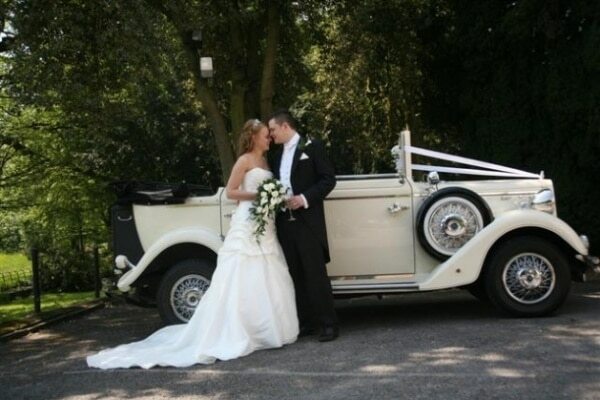 Our Wedding cars are equipped with some of the finest cars which we have available for wedding hire in Cheshire and Greater Manchester including modern, classic and vintage cars for hire. The vehicles we have are complete works of art and have been used in television shows and in various promotions, when it comes to wedding hire in Alderley Edge, we will make sure you travel in style on your big day. Should you require special cars in Ashton Under Lyne or the surrounding areas, Horgans Wedding cars should be your first port of call. Having been established for a number of years, we’re known for our excellent reputation in wedding car hire. From our 1930s style Beauford Tourer Four Seater, Regent Tourer Six Seater and Royale Windsor vehicles, as well as our stunning new Imperial Seven Seat Landaulette. We also don’t charge for extra time or mileage in our services and you can trust your day or even will be special as our vehicles will only attend one wedding or occasion. The two most important people when it comes to wedding are the happy couple. Most couples will barely get any real time together during the whole occasion, but having chauffeur driven wedding cars means you can relax and unwind together. Choosing an extravagant car for your big day can have a number of benefits to both the happy couple and the day itself. At Horgans Cars, we understand that couples want to be captured in their wedding car and that’s why our team allow plenty of time for photo opportunities. Whether you choose to prop up against your wedding car for the ultimate wedding pose or enjoy a romantic kiss in the back of the vehicle; the photo opportunities are endless. Our fleet of vehicles are perfect for any couple to enjoy and use as photo opportunities. When you choose Horgans Cars, the car and the chauffeur come as a package and all you need to do is relax and enjoy the view from the window. Unlike using a cab service, you need not worry that the classic wedding car will run late. Our seasoned drivers understand how important this day is to you and your partner and will ensure you get to the ceremony on time. We’ve been doing this for years. Why Choose Horgans Wedding Cars? Should you require a first-class wedding car hire service in and around the Alderley Edge area then be sure to contact the team at Horgan’s Wedding Car Hire today. We are proud to have a team of highly trained chauffeurs who provide a safe, reliable and overall efficient service. Our standards are proven and recognised through customer testimonials and referrals where some of our work comes from. Not only do we provide a range if wedding cars in Alderley Edge, we also offer personal chauffeur driven services. After we’ve picked you up from your chosen location, we’ll safely transport you to your wedding destination, ensuring that you look spectacular as you arrive. The range of wedding cars that we offer includes a variety so you can find the perfect match to the theme of your wedding day. Within our range, you’re bound to find the perfect wedding car for hire. Simply call our team today, whether you’d like to discuss wedding car hire prices or the wedding transport available, our friendly staff are more than happy to answer any questions you may have. How Much Notice Do I Need to Give Before Booking my Wedding Car? Many couples start looking for a car around six months before the wedding date, but the sooner you start looking for your dream wedding car, the more choice you will have. At Horgans Cars we recommend you reserve a car at least 1 year in advance. It’s simple! Contact one of our friendly and helpful team members by email or phone to make sure your date is free for your selected choice of car. We will need date of hire, collection time, duration of hire and where your wedding will take place, then we can provide a quote. Call or email or team today who will be more than happy to assist. If My Wedding Ceremony and Reception is in the same Location Do, I Really Need a Wedding Car? It’s your big day after all, so why not make sure you arrive at your ceremony in style? Your chauffeur will wait until the ceremony finishes for those all-important photo-shoots of you and your wedding car, we can also take you on a short drive if you wish.